Bridges constructed using timber are called timber bridges. These are generally constructed for short spans or as temporary bridges. They are not useful for heavy loads. Masonry Bridge constructed by using bricks or stones. These are generally constructed for short spans and in low depth canals. Steel bridges are constructed using steel bars or trusses or steel cables. These are more durable and bear heavy loads. 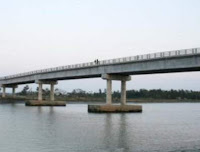 R.C.C bridges are constructed using reinforced cement concrete. These are more stable and durable. They can bear heavy loads and are widely using nowadays. If concrete material is placed under compression before applying the loads, then it is called as prestressed concrete. To construct pre stressed concrete bridge, pre-stressed concrete blocks are arranged as deck slab with the help of girders. These blocks are suitable for shorter span to longer span bridges.